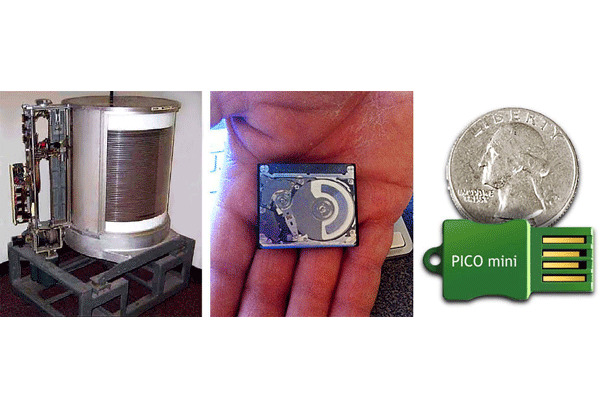 The history of the hard drive, through pictures. A punched card was once the basis for digital information used for computer programs and data storage. They were widely used throughout the first half of the 20th century in processing machines to input data and to store it. Punch cards could be fed into the first commercial computer, IBM 305 system, which then stored the data on hard disks. 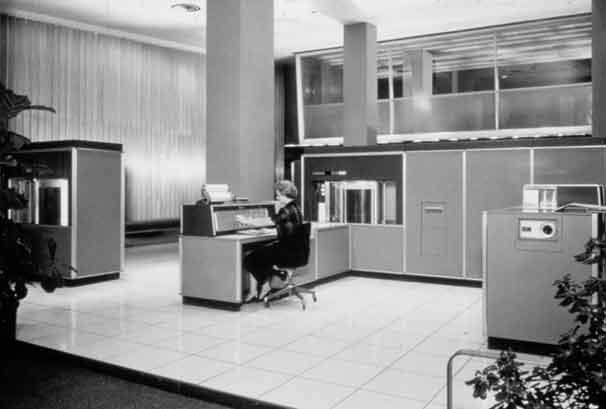 Photo courtesy of IBM Archives. 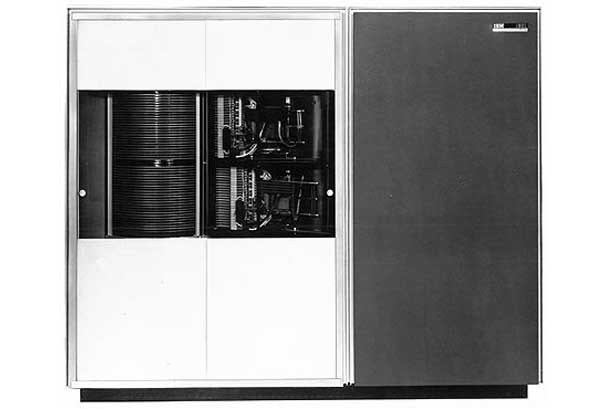 The 350 Disk Storage System was a major component of the IBM 305 RAMAC (Random Access Method of Accounting and Control) system, which was introduced in September 1956. It consisted of 40 platters and a dual read/write head on a single arm that moved up and down the stack of magnetic disk platters. Those 40 platters stored a whopping (for the time) 5MB of data. 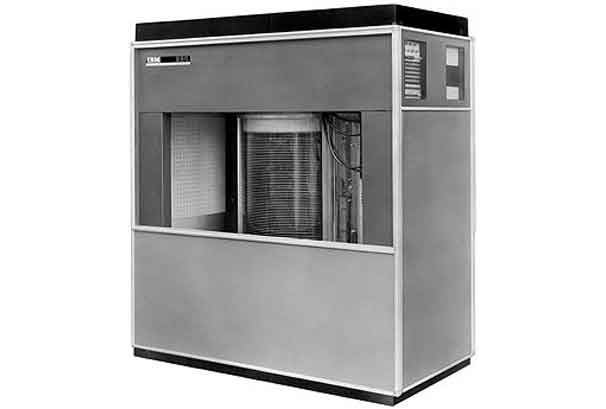 Introduced in 1956, the IBM 305 RAMAC (Random Access Method of Accounting and Control) was an electronic general-purpose data processing machine that maintained business records on a real-time basis. The 305 RAMAC was one of the last vacuum tube systems designed by IBM, and more than 1,000 of them were built before production ended in 1961. 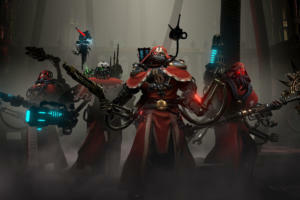 The system took up the better part of an entire room and required three administrators to run it. 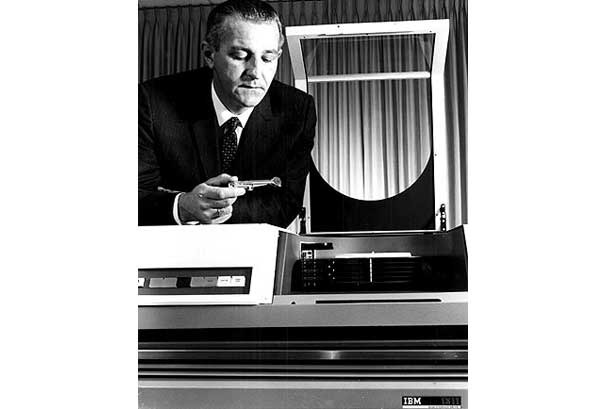 Al Hoagland, who during his 28 years at IBM helped to create the world's first disk drives exclusively for the RAMAC computer, said what upset him at the time was that few thought disk drives had a future. Photo courtesy of Al Hoagland. 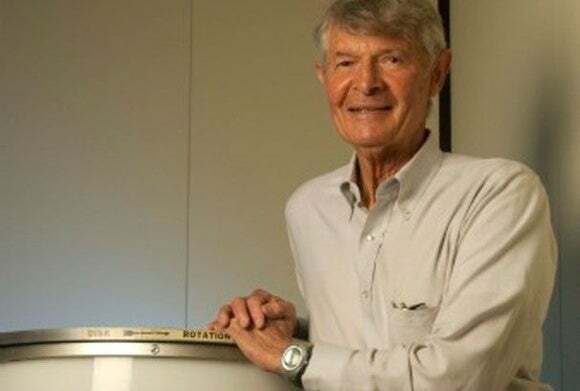 The magnetic disk invented by IBM in the early 1950s contained 100 concentric tracks on each side. Each track stored 500 alphanumeric characters, yielding a total storage capacity of 5 million characters. 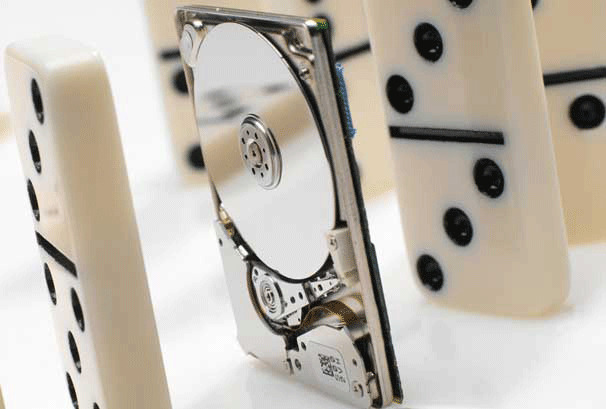 This disk enabled users to retrieve any piece of information directly in less than a second. This 16-inch-long drum spun at 12,500 revolutions per minute to provide the IBM 650 computer of the mid-1950s with 10,000 characters of main memory. 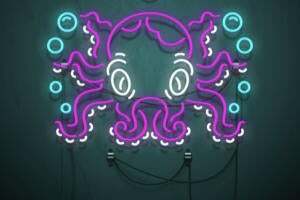 Data was magnetically encoded on 40 tracks around the drum. The drive system, which shrunk storage technology from the size of a refrigerator to the size of a washing machine, had six 14-inch platters and contained a removable disk pack that had a maximum capacity of 2.6MB of data. The 1311 lived on through the mid-1970s. Only two years after creating the RAMAC 305, IBM released the 1301, the first storage system that used "flying heads" on actuator arms to read and write data to its 50 24-inch magnetic platters. The 1301's head and actuator arm assembly looked something like a bread-slicing machine turned on its side because each drive platter had its own read/write head. 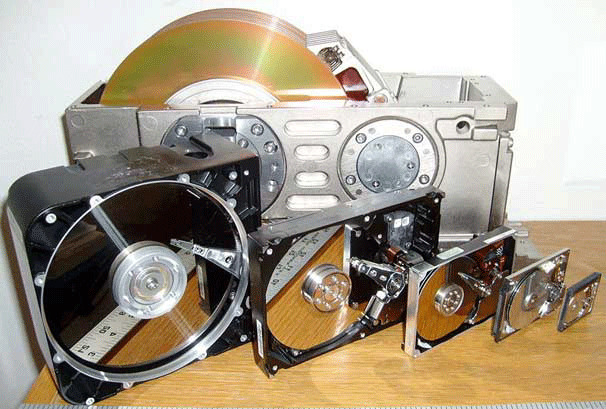 From 1979 through today: Six hard drives beginning with an 8-inch model, followed by 5.25-inch, 3.5-inch, 2.5-inch, 1.8-inch and 1-inch disks, partially disassembled to show platters and read-write heads. Photo courtesy of Paul R. Potts. Microdrives spurred greater innovation in handheld devices, such as Apple's iPod. When the iPod was first released in 2001, it had a 1.8-inch hard drive with 5GB of capacity. By 2006, the iPod was equipped with a microdrive that held 160GB. Solid-state storage, or NAND flash, is quickly usurping hard disk drives as the medium of choice for personal mobile storage. This Pico mini flash drive from SuperTalent holds 8GB of data. Today, however, USB drives the size of a pack of gum hold up to 256GB of data. Photo courtesy of Super Talent. In 1956, the RAMAC 305 stored 5 million characters. 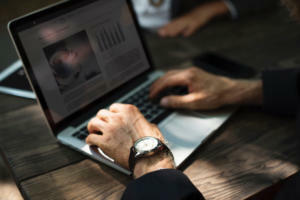 Today, hard drives stores as much as 3TB of data, and solid-state technology is quickly approaching a terabyte of capacity in a single drive. Photos courtesy of IBM, Hitachi and SuperTalent.